“Tropic reef flow” is now complete, and I’m very pleased with it. The colour used created a joyous feeling for me….hope the same happens for you! In this piece I’m showing the essence of the coral reef experience…flowing water, the blue aqua ocean hues, glimpses of coral and sea life, tropic sunsets, the moving living thing that the reef is. I’ve snorkelled on the Great Barrier reef and this memory remains vivid for me to this day, and there’s also memories of swimming in rock pools and being amazed by the variety of life in those secret places. Hope you enjoy this work as much as I do! 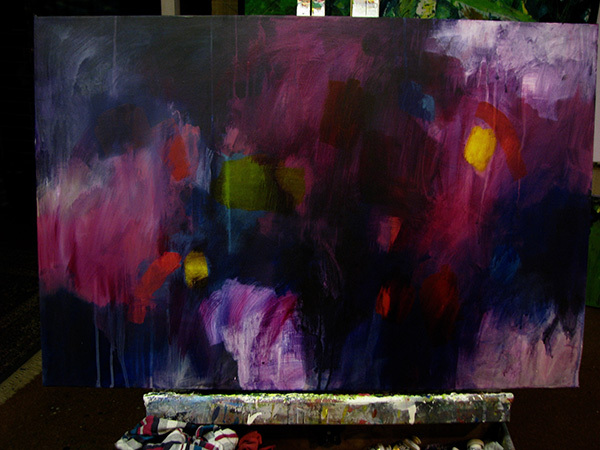 This dramatic and vibrant artwork is the latest from my studio. The title “Dark mountain, red sky” is evocative of restless power and drama, and the colourful primary hues exude a joyous feeling. There’s a lot of energy and movement in this work and I certainly enjoyed it’s making. Hope you do too! It’s priced at $530(AUD)…that’s Australian dollars.